Forge Island, identified as the key site in the continued regeneration of Rotherham town centre, is being advertised for sale. Previously the Rotherham Forge & Rolling Mills, the 4.23 acre site is currently home to an empty supermarket and a car park following the relocation of Tesco across town in 2014. It was identified as a suitable site for development of a town centre leisure hub as detailed in a council-commissioned planning document which placed bringing a cinema and leisure development to Forge Island as the first "key move" in the town's renaissance. Market analysis has suggested that there is an appetite amongst cinema operators to locate within Rotherham as part of a wider leisure scheme, including a family pub/restaurant, gym and hotel. There is also the potential for a residential element on Forge Island. In 2012, the Council's cabinet confirmed Forge Island as the preferred site for a town centre cinema and theatre development and developers and operators where sought. Rotherham town centre has been without a cinema for 25 years. Now commercial property agents, Savills has listed the Forge Island site for sale on a number of property pages. The freehold of the site, which includes a boarded up 60,815 sq ft former supermarket and 320 parking spaces, has not been given a guide price. The Council included an option to buy the site for £1.5m when Tesco vacated and moved across town to the a £40m store on the site of former council buildings on Drummond Street. Since the retailer's relocation, the Council has been operating a car park on the site, offering free parking designed for shoppers. Arrangements were being progressed for the strategic acquisition of the vacated site, which could include a purchase and sale to a third party. A Council decision on the site was deferred in December 2015 in order that further investigations and information could be received. A key decision on the issue was pencilled in to be made at the Cabinet/Commissioners' Decision Making Meeting on April 11 but no such decision has been made. It is no longer on the Council's forward plan of key decisions. Last year, Rothbiz revealed that discussions were taking place with private sector developer, The Evans Property Group on a potential 200,000 sq ft office development on Forge Island. However, a bid was knocked back for £6m of pubic sector funding via the Sheffield City Region Local Enterprise Partnership's investment fund for strategic infrastructure investment (SCRIF). Consultants at Jacobs identified in a 2013 study that around £6m would need to be spent to deal with flooding and ground issues on the site. A masterplan is currently being refreshed setting the strategy for investment in key town centre sites and the Council is set use its financial firepower to invest around £17m in key projects that have been agreed in principle as those that should be supported. These include a cinema, which in turn is expected to attract secondary restaurant, shop and bar developments. ARUP's supplementary planning document states: "Forge Island will become a major new piece of the Town Centre, with a strong leisure and residential focus. Forge Island will be a new mixed-use leisure hub. 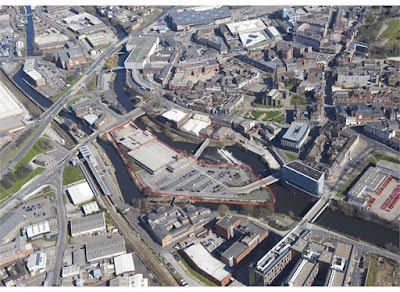 Proposals should seek to incorporate a mix of residential units and leisure developments (including A3/A4/D2 uses [restaurants, pubs, leisure]), to help create a new and vibrant Leisure Quarter in the centre of Rotherham that complements the existing Retail Quarter. "New linkages should be created across the river, to provide movement routes on an east-west and north-south axis, intersecting at a new public square."